Helping to ban single-use plastic bottles in Cape Town by using clean drinking water generated from undrinkable water. After years of severe drought, Cape Town was unable to meet public demand for drinking water from municipal sources,. 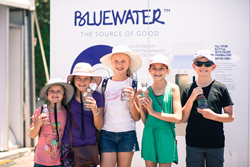 The crisis led to Bluewater harnessing its advanced water purification technologies to reuse non-potable water to generate pristine water from four water stations able to deliver up to 32,000 liters of water per day and thus avoid the use of tens of thousands of single-use plastic bottles.